Katherine Losse’s The Boy Kings: A Journey into the Heart of the Social Network came out June 26th. For those wanting a quick fix before delving into the 256-page tome, The Huffington Post assembled a slideshow of thirteen juicy bits, or, as their editorial department put it: “Thirteen Uncomfortable Revelations About Facebook’s Early Days,” courtesy of Losse’s new book. 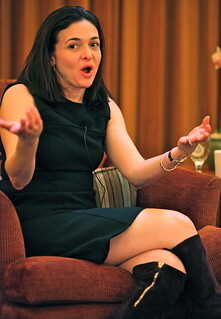 Some of the revelations presented are surprising, others — Facebook had management problems before Sheryl Sandberg stepped into the COO role? — less so. Reviewers have been impressed by the blatant sexism that, according to Losse, went on unabated for years. Losse, who was the fifty-first hire at Facebook, but only the company’s second female employee, makes it clear that an equitable working environment across genders was not something Facebook’s leaders cared about until Sheryl Sandberg entered the scene. In Losse’s assessment: “Mark was too busy programming to get to the part of a liberal arts education where you study social inequality.” Ouch. Other interesting tidbits include the fact that early on, Facebook administrators had access to a “master password” that allowed them to log in as any Facebook user. Also, “dark profiles” were once created for those who were not yet part of the network, but whose friends had uploaded and tagged their pictures. Visit the complete slideshow to read about Judgebook, an app reserved for Facebook employees that permitted all Facebook female users to be “judged” on their looks. Too darling.